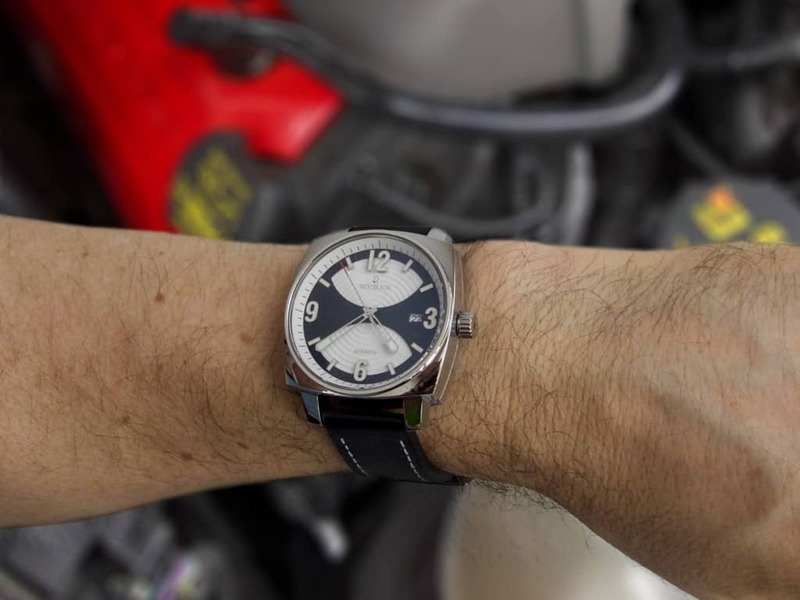 My name is Guy Roebuck, founder of Roebuck Watch Company. Born and bred in New Zealand, I now live in Austin, Texas. I have been working as an Architectural draftsman for a long time and was at the point where I wanted to make a change. 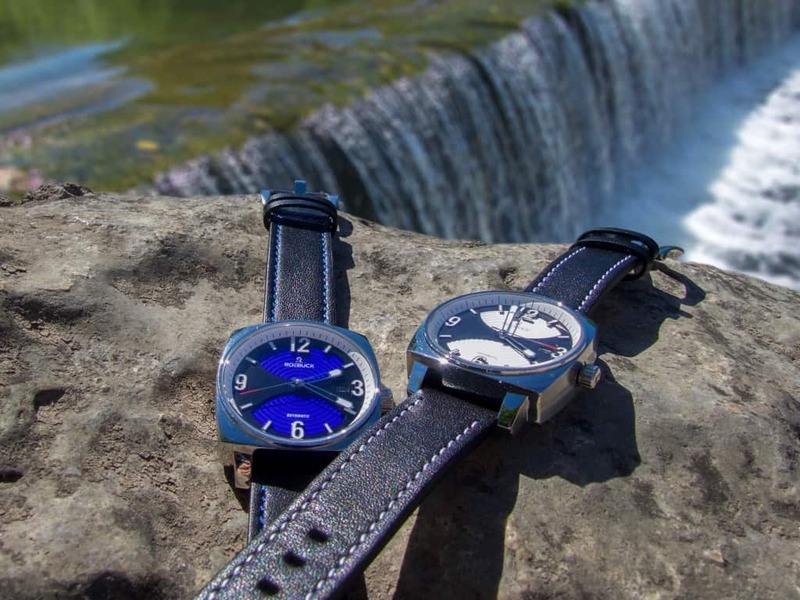 I enjoy design and have a fascination for watches so this moved me to set up my own boutique watch brand and create my first watch–the Alpha. I think Alpha is an apt name—often used to mean the first or beginning. The Alpha is my first watch and the beginning of Roebuck Watch Company. With the Alpha series I wanted a watch that was bold, something that stood out from other watches and it had to be well made from quality materials. The dial is what first catches your eye, especially in the dark blue—this appears to be the clear favorite. The dial was inspired by water and the amazing patterns that its movement creates. It is a sandwich dial made up of three layers. The bottom two represent a bridge over water into which something has been dropped creating ripples radiating outward. The third is the polished numerals and indices of which the 12 and 6 markers and the indices either side cantilever over the lower dial—a reference to architecture that feature cantilevers to great effect like Frank Lloyd Wright’s Falling Water. 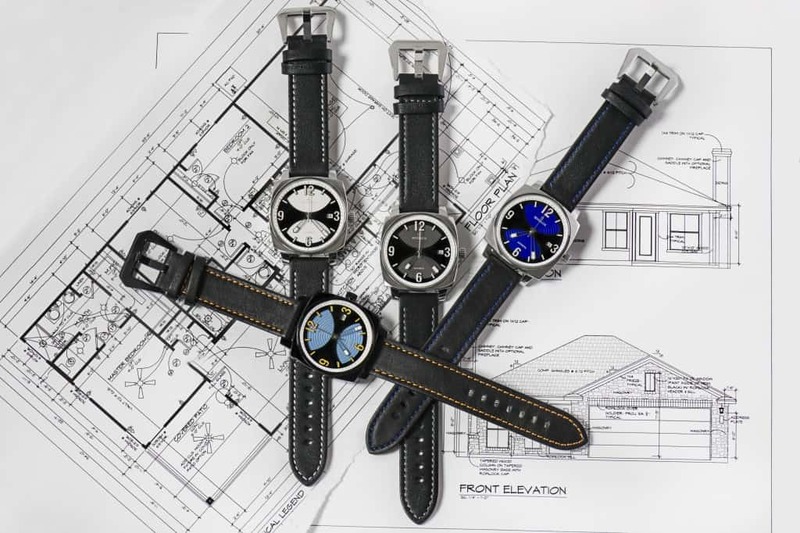 The lower dials come in four colors—white, dark grey, blue and light blue. The hands are skeletal so very little of the lower dials are obscured. They are polished and tipped with Super-Luminova C1 lume—as are the numerals and markers. The Alpha’s case is my take on the cushion design and is 40mm x 40mm. There are two finishes—polished stainless steel and PVD coated with a dark gun finish—named the Black Sheep. Both cases have horizontal brushed sides along with an etched stripe centered on the crown and vertically brushed lugs. 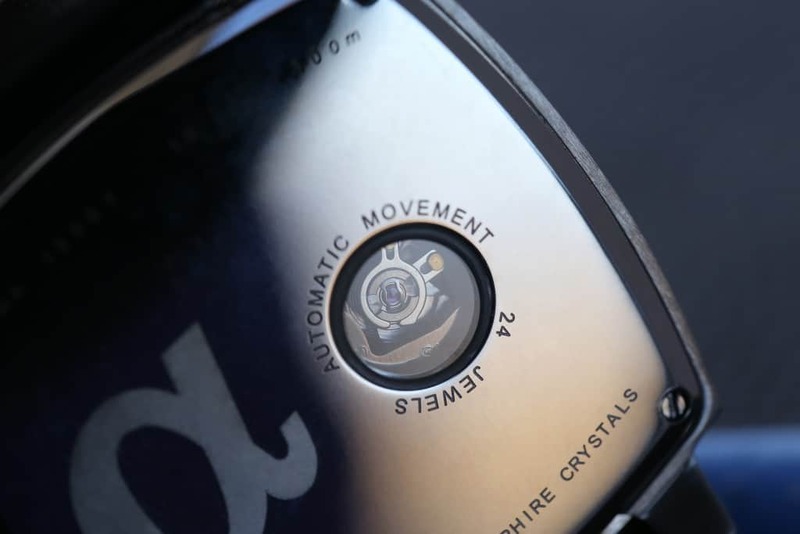 The upper crystal is double domed with an anti-reflective coating to the underside. The porthole in the rear is also sapphire crystal and gives a great view of the balance wheel movement. 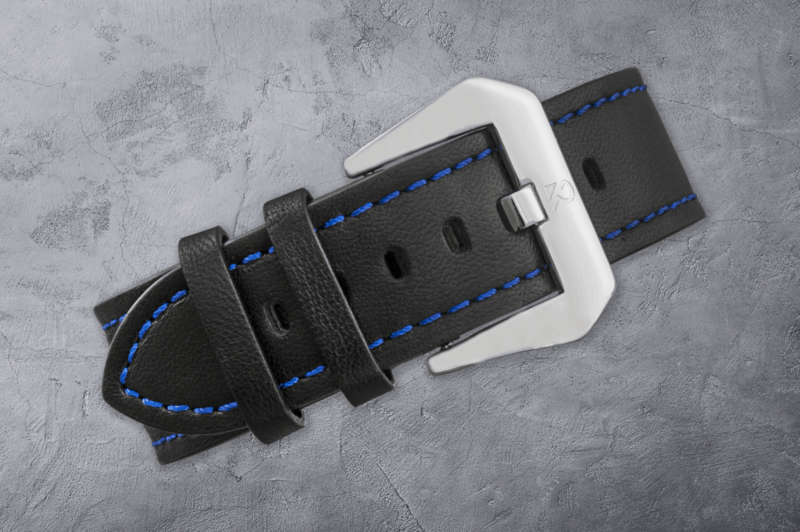 The 20mm wide straps are Italian leather with lower dial color matched stitching and matched to the numerals on the Black Sheep. The buckles are polished with the company logo etched in, again the Black Sheep’s buckle is PVD coated to match the case. The trusted Seiko NH35A automatic movement powers the Alpha series, chosen for its track record for reliability. It features: 41-hour power reserve, hacking, hand winding and bi-directional self-winding. The Alpha comes in a travel case which makes it easy to take two watches on vacation—there is room in the lid for additional straps. 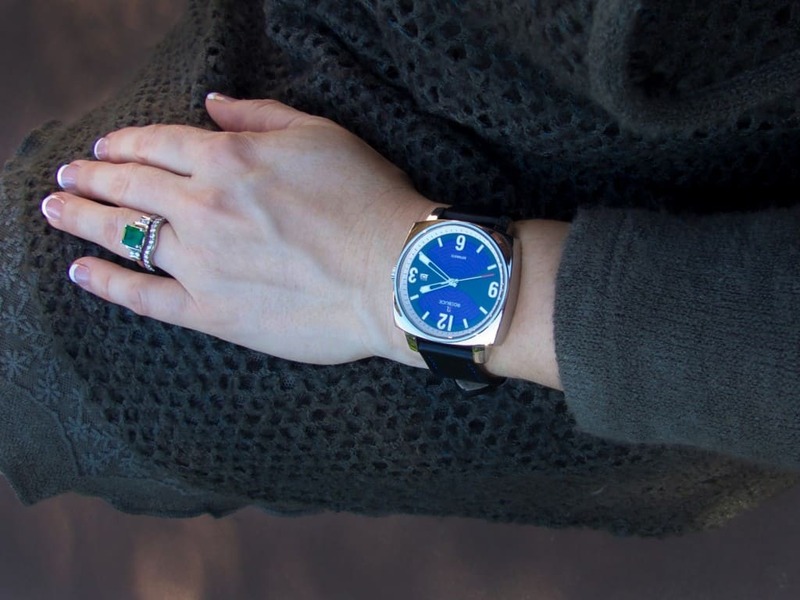 For a watch that stands out from the rest and can be dressed up or down to suit any situation, look no further! My Kickstarter campaign is now live and there are some deep discounts still available.